More Than 60 Breweries Are Making a Beer With the Exact Same Name. Here's Why. It’s confusing. I’m drinking a juicy hop-forward beer with red and white stripes from Finback. It's called People Power. Then it’s a blue can from Threes Brewing with an American flag balloon containing a bright, refreshing pilsner. It’s called People Power. Then I'm tasting a mellow pale from Industrial Arts with multi-colored counties dotting the can. You can probably guess the name of this beer. All three are a part of the People Power Beer project, which launched on the Fourth of July, helmed by Threes Brewing out of New York. 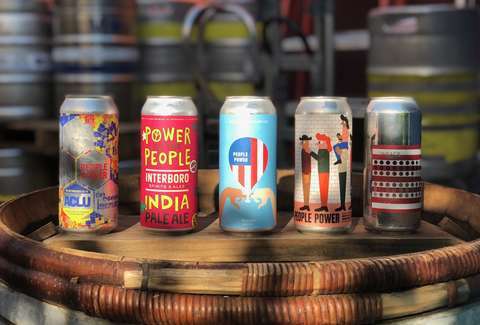 More than 65 breweries have signed up to create a beer called People Power and donate 10% of the proceeds to the American Civil Liberties Union’s People Power campaign. That campaign impacts voter mobilization and is "the ACLU’s platform for grassroots action," says Lauren Weiner, Political Communications Manager for the ACLU. Now, the list seems to have grown every time you look. More than 65 breweries are creating their own People Power beer between the Fourth of July and Election Day. That includes breweries across the country including Alvardo in California, Fair State Co-op in Minnesota, The Collective Brewing Project in Texas, Brew Bus in Florida, and Hawaii's Homebrew in Paradise. Something about the communal nature of the campaign and an exciting way to support the ACLU has drawn brewery after brewery to the project. Craft beer is about community. Big beer is buying up craft breweries left and right, so it's not just about quality. The thing that sets craft beer apart on a national scale is the kind of communal bonds a brewery is capable of creating. While the brewers involved in People Power Beer are supporting a cause, the organic growth of the project and its aim of supporting local communities through the ACLU are a fresh reminder of what can make craft beer special. Release dates and availability will vary.